At least 285 people have contracted measles in the city since September, and the order covers four Zip codes in Brooklyn’s Williamsburg neighborhood where the vast majority have originated, de Blasio (D) said at a news conference. The mandate orders all unvaccinated people in the area, including a concentration of Orthodox Jews, to receive inoculations, including for children over 6 months old, the AP reported. Anyone who resists could be fined $1,000. Colorado has one of the lowest vaccination rates in the country, and experts warn a similar measles outbreak could happen at any time. This is utter lunacy. ► Speaking, er, writing about Sen. Pete Lee, the editorial board of the Colorado Springs Gazette printed a ridiculous un-endorsement on Monday. ► Democratic Presidential candidate Elizabeth Warren will make a campaign stop in Aurora next week. ► Israelis are voting today in one of the more consequential national elections in that country’s history. Vox.com breaks down the ballot. ► Robert Schentrup, whose sister was killed in the 2018 Parkland High School shooting, pens an opinion piece for the Colorado Sun in support of so-called “red flag” legislation recently approved by the Colorado legislature. The process is designed to be walled off from White House interference, in part because of corruption that took place during the Teapot Dome scandal in the 1920s. ► President Trump pressed officials to close the U.S. border in El Paso as recently as a few weeks ago. ► Colorado is one step closer to its own Net Neutrality regulations, and that’s a very good thing indeed. ► Democrat Danielle Kombo is no longer a candidate for U.S. Senate. In other news, Danielle Kombo was once a candidate for U.S. Senate. ► “America is full.” President Trump may be channeling former Congressman Tom Tancredo, but he’s not speaking for the rest of the country. ► The Trump administration really, really wants to challenge the scientific consensus about Climate Change. The rest of the federal government is not interested in playing along. The U.S. military, meanwhile, is actively planning for dealing with Climate Change. 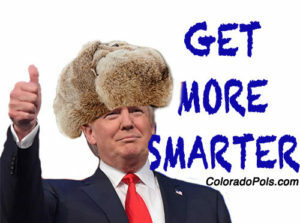 ► The Colorado Republican Party appears to have completed its journey from #NeverTrump to #OnlyTrump, as Justin Wingerter writes for the Denver Post.